So sore. Those are the first words that I typed. And I’m going to leave them there because I think they are appropriate. Also, certified. So certified! 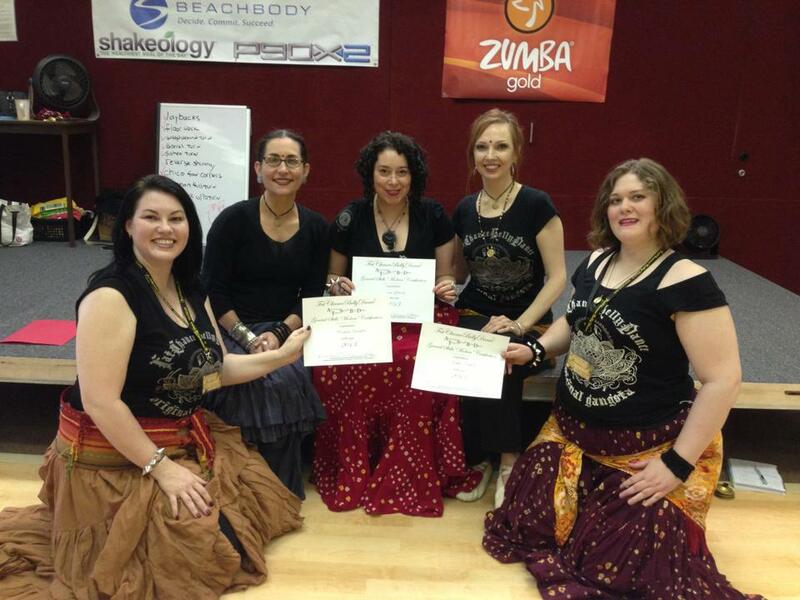 As you can see above, my troupe mates and I became utterly certified last week in General Skills for American Tribal Style Belly Dance. This is our troupe picture to prove that we did it! I had hoped that by the time I posted this, I’d have found frames for my certificates but, alas, this has not happened. So we’ll just have to make due with these cell phone pics. 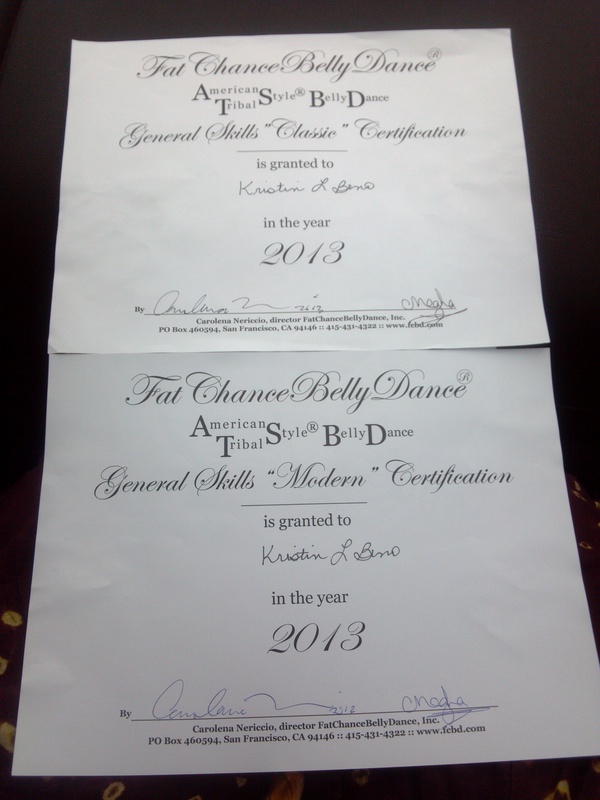 These are my certificates for both “Classic” and “Modern” categories of General Skills. I will try to get them properly framed soon. And I think I’d like to get them scanned to make sure I have a digital version in case something ever happens. Those certificates were five years in the making. I’m very, very proud of them. The flavor goes completely undescribed on the Faygo website, but I have read online that it’s somewhere between a cherry cola and a cream soda. And I’d have to agree. Our trip home was uneventful except for periods of rain. And to say that I was exhausted the next day is an understatement I slept all night, took a three hour nap during the day and slept the next night through again. But to reward myself, and to celebrate a friend’s birthday, I went to a Korean style bath house this past Sunday. Other things that happened between getting certified and arriving home: another of my six word stories was featured on the Haunted Waters Press website in the Penny Fiction section! This one was not included in the actual journal, but is in the Scattered Pennies area of the Penny Fiction web page. I have more info on the Writing page of my blog, if you’re interested. My next appointment with the reproductive endocrinologist is on the 29th of this month. Right after my birthday on which I turn 31 years old. I wish I could prepare for it somehow. But that’s the kind of thinking I used to employ. There is nothing to be done except live my day to day life and try not to concentrate on the fertility treatments as if they were my job. I’ve got lots of other things to do. Shimmy Mob is coming up. My new troupe and I have lots of work to do. Costumes to make. Practicing as newly certified dancers. Workshops to attend. And as Spring turns into Summer, there will be parties to go to. Dodgeball at the park. Pool parties. Wedding receptions. Hosting baby showers. Getting Sister Spirit finished for publishing. And, of course, work keeps me busy. There are lots of activities to keep my spirits up as I fiddle with nature and dose myself with hormones. Maybe I’ll have good news soon. Maybe I will just keep living my perfectly good life as is for a while longer. Maybe we’ll find out something definitive. Who knows? All I do know is that I will be fully implementing my It Will Happen experiment in the next couple of weeks. I will share here the visualization techniques, any supporting materials or useful information I scrape together as I transition from NTNP (Not Trying Not Preventing) to full-time TTC (Trying to Conceive) again. I hope you’ll join me as I journey. Dawww, thanks so much! You’re the best MIL ever!